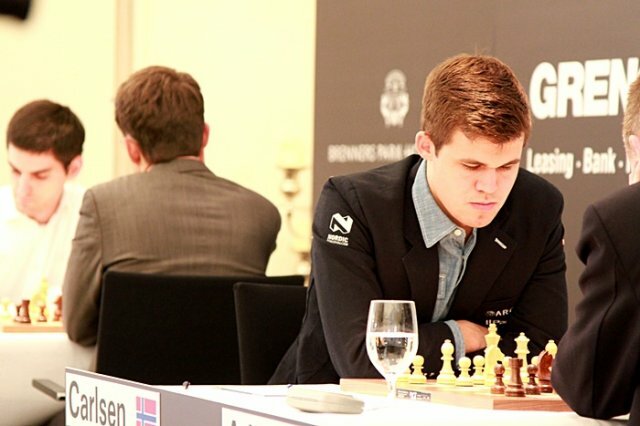 World Champion Magnus Carlsen showed no mercy to his second Michael Adams as he increased his score with the white pieces against the Englishman to a bruising 7.5/8. That win took Carlsen into the sole lead as Fabiano Caruana and especially Viswanathan Anand appeared to miss winning chances. Levon Aronian could breathe a sigh of relief that the damage against David Baramidze was limited to an early draw. He’s got a slight tendency to avoid concrete moves – an instinctive tendency to go for positional solutions. I was running a bit short of time and I just played horribly. Adams failed to play the move it seemed he’d prepared – 35…Bxa5 – later despondently commenting, “it’s already gone by then”. His 35…Qa8 enabled Carlsen to hold on to the passed pawn long enough to force a won rook ending. 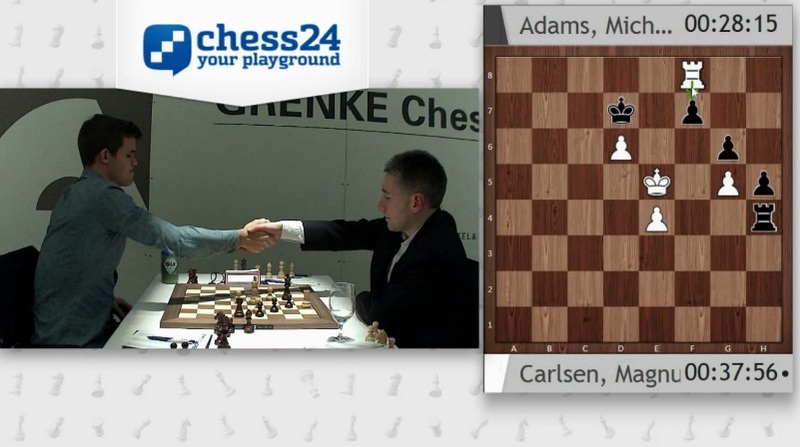 His grip never eased, although the game only finally ended – for a second day in a row for Magnus – on move 64. It ended a “barren spell” for the World Champion, who is of course still on track to win his second supertournament in a row! That was a very welcome win for the tournament as well, since the other games flattered to deceive. 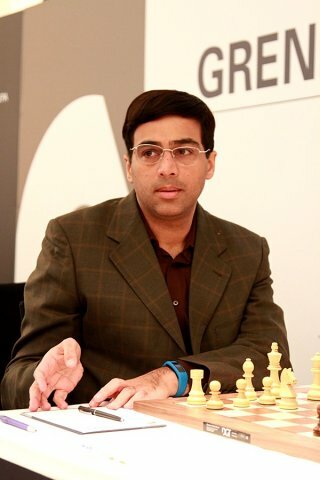 Vishy Anand has good memories of playing White against Arkadij Naiditsch in Baden-Baden, since he won the 2013 GRENKE Chess Classic after a bizarre final round game in which Naiditsch only really paused for thought when he’d raced into a lost rook ending. Something rather similar happened in Round 2 in 2015. Of course I misplayed horribly the opening and got a very bad position. David is no average 2600 player. If he survives the opening he’s a very strong player. 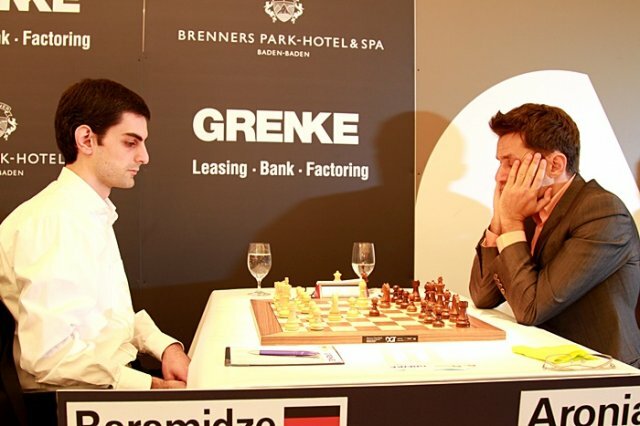 Aronian seized his chance to clarify the situation with 25…c5! and the remaining moves were blitzed out at blink-and-you’ll-miss-them speed. 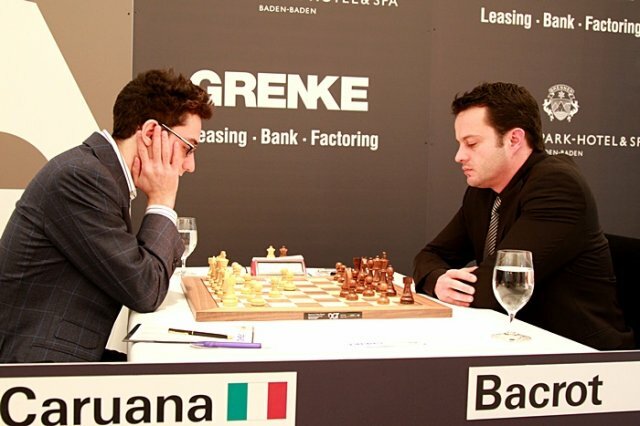 That leaves “only” Caruana-Bacrot, which was the day’s most enthralling encounter. Here, to Jan Gustafsson’s dismay, first Peter Heine Nielsen, then Magnus Carlsen, then Fabiano Caruana, then Etienne Bacrot all felt Black should have played 14…a5, shutting up the queenside in order to concentrate on the kingside. Bacrot himself said he didn’t play it since he, “overestimated the position”. He went for the move computer’s advocate, 14…g5, but after 15.a5 it didn’t take long for Caruana to seize the initiative. He kept repeating afterwards that although the black pieces look menacing he couldn’t see any real threat to his king.